The GV static mixer has been used successfully in turbulent flow applications for over 40 years. It is a high performance inline static mixer capable of mixing low viscosity liquids, blending gases, dispersing immiscible liquids and creating gas-liquid dispersions with a very high degree of mixing in a short length. 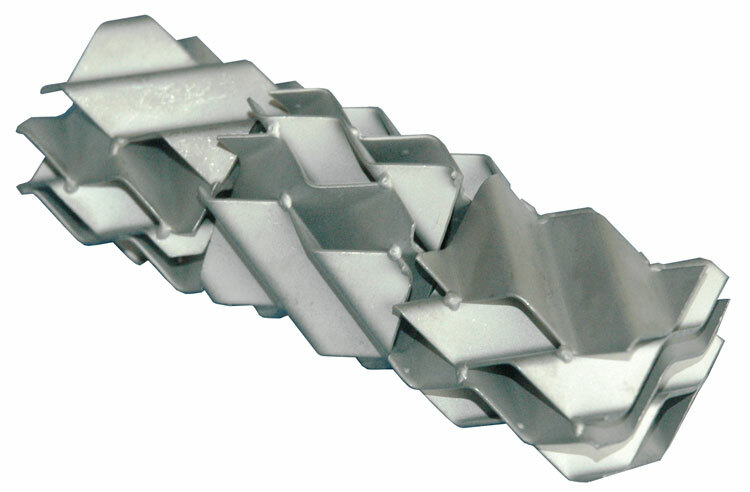 Figure #1: GV static mixer with 3-mixing elements, 5-corrugated mixing plates across its diameter and a 45° corrugation angle relative to the pipe axis. Figure #2: GV static mixer front view with 5-corrugated mixing plates across its diameter and a 45° corrugation angle relative to the pipe axis. 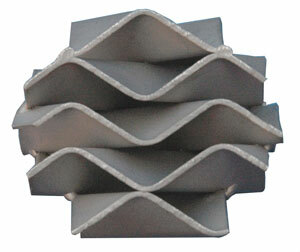 Standard GV static mixers are constructed with 5-corrugated plates across their diameter with a 45o corrugated plate angle relative to the pipe axis (Figures #1 - #2). Corrugation angle can vary (Figure #4) to affect intensity of mixing and pressure drop. Spacers between mixing elements take advantage of empty pipe turbulent mixing created by the upstream motionless mixing element (Figure #5) at no additional pressure drop penalty. Figure #3: The mixing intensity and pressure drop of the GV static mixer may be adjusted by varying the number of corrugated layers in any specific pipe diameter (left side: standard 5 layers; middle: 8-layers; right side: 12 layers). Figure #4: The mixing intensity and pressure drop of the GV static mixer can be adjusted by varying the corrugation angle relative to the pipe diameter (left side: standard 45o angle; right side: 3045o angle). Figure #5: Spacers can be added between mixing elements to take advantage of the turbulent eddies created downstream of a mixing element at no additional pressure drop and at modest cost. The GV static mixer was invented by Sulzer Chemtech of Winterthur, Switzerland in the early 1980’s who trademarked the design as the SMV* static mixer. Sulzer did a tremendous amount of fundamental high quality R&D work on the SMV structure and commercialized the SMV static mixer in tens-of-thousands of successful installations. The founders of StaMixCo held key technical and management positions in the Koch Engineering-Sulzer Chemtech team that commercialized the SMV static mixer. * StaMixCo is not a distributor of or affiliated with Sulzer Chemtech. SMV is a brand and trademark of Sulzer Chemtech.